As Bitcoin gains in value and its popularity explodes, more people are asking: “what is Bitcoin?” To understand what Bitcoin is, one must first understand its centralized counterpart, fiat currency or government backed currency (USD, Euros, etc.). Fiat currency has inherent issues since market forces, guided by supply and demand, are subject to state interventions. Given that central banks often have unobservable goals, traditional currency has transparency and accountability challenges. The strength of fiat currency is as good as the perceived backing. When management of fiat supply is influenced by central institutions, it creates an inflation bias. Bitcoin sought to solve the issues of runaway inflation and manipulation with a deflationary currency that can never exceed 21 million tokens, and prevents most manipulation schemes thanks to the built-in cryptographic security measures. In the same vein, Beenest aims to tackle the problems inherent in current centralized home-sharing platforms. To understand this, let’s first explore what a centralized home sharing platform like Airbnb offers. Only then will it make more sense how we are able to provide a superior experience while charging 0% commission. What does it mean to be centralized? Hotels are a centralized model. Before Airbnb and similar companies, there were few options for short-term stays. Hotels, like an industry incumbent, had no reason to want to share its easy revenue generating model with others. Though Airbnb has certainly been disruptive to the hotel industry, it is inaccurate to call a 30 billion dollar company like Airbnb, “decentralized,” when it must charge centralized hospitality fees, has thousands of employees, and follows a centrally controlled company structure. Furthermore, Airbnb charges a “rent” or a fee to use their platform, something a truly decentralized platform cannot do by definition. Many people believe Airbnb to be decentralized because users interact to do business with one another, as opposed to giving money directly to a hotel. However, less centralization does not constitute decentralization. Airbnb offers a platform that has an ease of use, where everything is bundled for the host and user, and like the ease of use of credit cards, and banks, these “usage” fees begin to add up until the users realize they have had enough of having their property and their money being abused. As a centralized company, Airbnb has all of its users’ data stored in one centralized database, that has one point of breach, where if it is hacked then everyone’s data is exposed. In today’s fully automated world, how safe should that make users feel? Airbnb’s conflict resolution can be summed up by either applying their own in-house Resolution System, which leaves it up to their own judgment, or by involving centralized small claims courts. The idea for Beenest was born because of the issues surrounding centralized platforms: security, reputation, and high, inescapable usage fees. 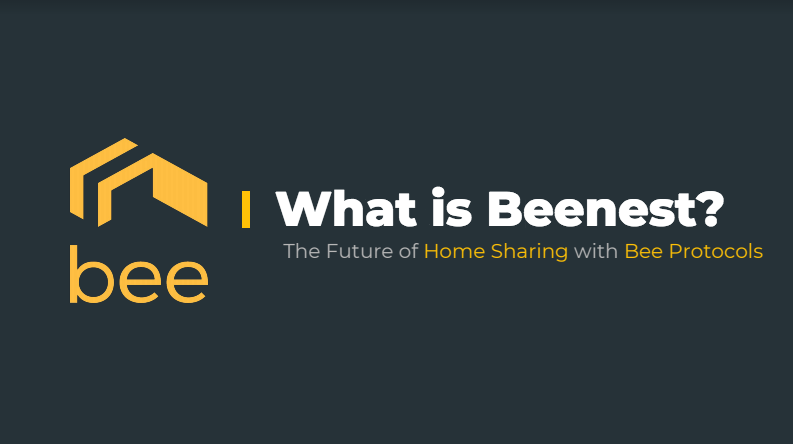 Bee creates and preserves value for hosts, guests, arbiters, and developers within a decentralized autonomous organization and our decentralized model offers distinct advantages over the predominant, centralized home sharing model. The first priority we addressed from the get-go, since it was the one we heard the most, were the fees. Beenest simply charges 0% commissions to hosts and guests utilizing BEE, thanks to smart contracts automating transactions that bypass commission-based platforms, financial institutions, and currency denominations. As the Bee token is used for all transactions, there are no foreign transaction fees or currency conversion fees, and all savings are passed back to the hosts and guests holding the token. In this case decentralization is defined as circumventing usage fees. Win-win for the users. Identity is at the center of home sharing. What is it about the blockchain that gives a platform like Beenest an advantage? Beenest provides a seamless user experience based on trust and security through the blockchain. By using its in-house Bee Token, the Beenest platform provides its hosts and guests with the utmost privacy, security, and freedom. To use Beenest, users have to first sign up and go through a basic KYC (know your customer) process to ensure that users are real and authenticated. Beenest can seamlessly integrate with 3rd party authentication platforms and correlates identities with a weighted reputation score on the Bee reputation protocol. • Blockchains empower people — by the people, for the people! They eliminate the need for middlemen & data silos across thousands of platforms selling your personal details — Users are in control of their own information and transactions. The key thing to know is what and why and how decentralized blockchains fare better than their centralized counterparts. Systemic risk is the buzzword of our age, and when anything, especially identity and payments get tied together on centralized one-point of breach, it’s only a matter of time before the users are exposed. When great minds get together to tackle a problem, they realize that in order to solve it completely, they may need to generate more than one solution. The engineers sought to solve the problem of identity/security/conflict resolution by developing 3 protocols which it calls P-A-R (short for Payment, Arbitration and Reputation) Bee Protocols. While the Ethereum platform is still in its infancy, new second layer protocols are pushing it to become more suitable for building complex sharing economy applications like Beenest. The Bee Protocols will greatly benefit Ethereum by providing solutions for trustless decentralized payments and the inherent problems of any network: conflicts and malicious users. These protocols are designed so that existing centralized sharing economy applications like Couchsurfing or Airbnb can hook into our protocols to tokenize their offerings if they choose — giving them access to a larger and untapped market of crypto-enthusiasts. Conflict resolution is handled by Beenest with an ingenious arbitration model that our engineers came up with that is based on juror pools. What it does best is allows the users to be involved with judging malicious actions, rather than letting some outside system do the judging. Every system of payment that requires trust (i.e. exchange of physical goods and services) needs a third party to mitigate misbehavior. The arbitration protocol acts as the hub for dispute resolution. Participants stake BEE tokens to the arbitration protocol contract in order to participate in the arbitration network. The stake amount is based on the current USD value of BEE and corresponding absentee rates aimed at maintaining an arbiter absentee rate of <5%. As companies discover the benefits of blockchain technology, and all that it can provide for users in regard to security, identity, payment, and conflict resolution, many will be merging onto a decentralized platform to run their needs. Smart contracts on the ethereum network are precisely ways to secure information that is perfect for the home sharing network. We are not trying to just be another Airbnb, rather we are trying to be what a short-term home sharing network should have been all along: one that is user centric that takes into account all their needs and concerns. The Bee Token takes advantage of the changing behaviors of millennials and the recent popularity of cryptocurrencies and also the inherent misalignment of incentives that existing centralized sharing economies create. Our three protocols, the “P-A-R” protocols (Payment, Arbitration, and Reputation protocols) used in tandem will help dApps and 3rd parties to increase revenues, decrease costs, and save time. All in all, the Bee Token seeks to eliminate inefficiencies through the power of smart contracts, which enables organizations to operate with a completely new business model that distributes value to all stakeholders in a more equitable fashion.